This year was full of epic adventure and equally epic scenery; with adventure comes laughable moments and tripping over shoe laces. With that in mind, instead of doing a year in review to celebrate the closing of 2014, I thought I’d put together a blooper reel of sorts. Selfie of the year – Aspen and I took a moment to capture my Eastern Sierra birthday weekend. There’s a debate whether she was being suave and winking or she is only human and we caught her with a funny face. Stuck in a tree – Basil and I were relaxing on the top of Dicks Pass while on the Tahoe Rim Trail when another hiker approached. He made a bit of trail-small talk when he looked behind me and said, “Ugh, I think your dog is stuck in that tree.” I look back to find Aspen tangled amongst the branches of an adolescent pine. Actually, that’s what she does when she’s trying to get her pack off. Eliciting sympathy pup? Mission accomplished. Hey nice rack! – It may have been the altitude, the exhaustion, or the fact that whenever I see a buck or anything else with antlers I like to say, “Hey, nice rack!,” but I found this hilarious. 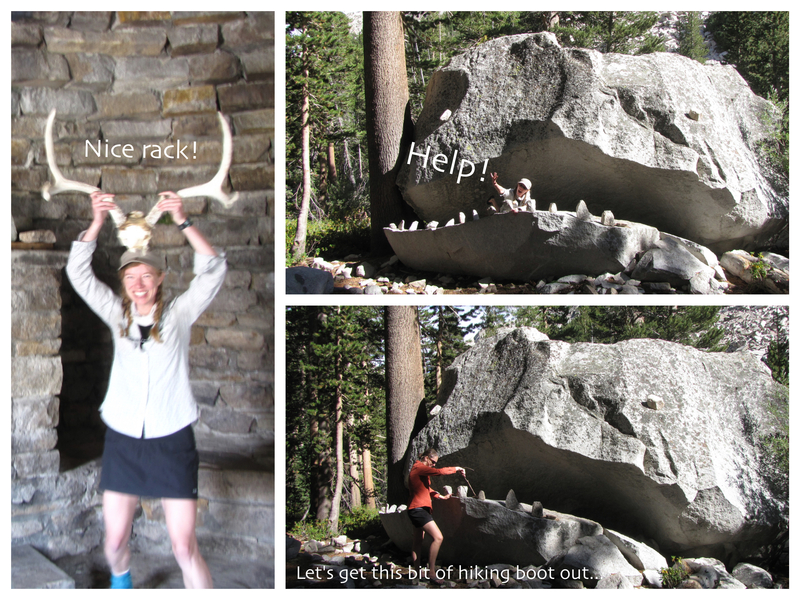 While enjoying the illustrious Muir Hut on the John Muir Trail I had to take a photo with this antler rack. JMT rock monster – After descending from Muir Pass we came face to face with the scariest beast we’ve seen on the John Muir Trail so far! Have no fear though, after the rock monster gobbled me up, Squirrel made sure to help him with his dental hygiene. My, what shiny dangly bits… – One of our missions while visiting New York was to get as many photos with statues as possible. 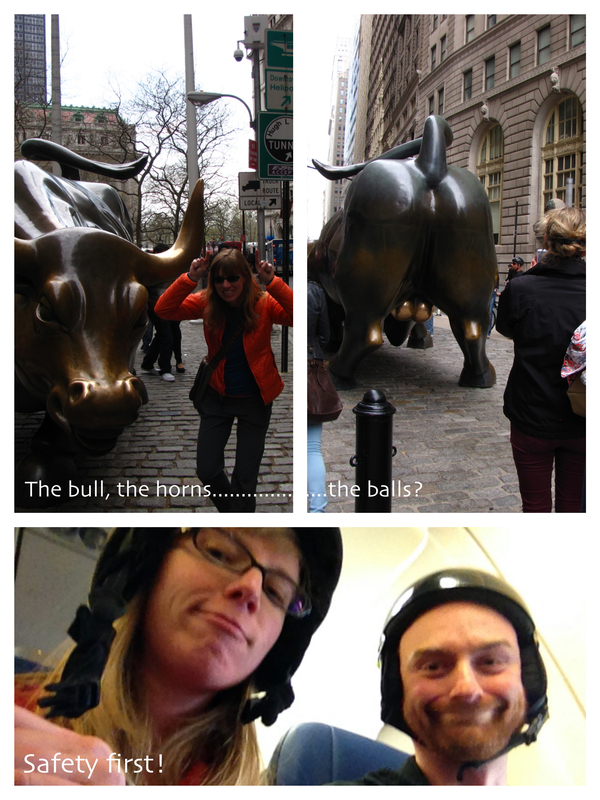 I heard about the Merrill Lynch Bull in the Wall Street area and how there was a line at the front of the bull and a line at the back. And it’s true! His nose is shinny from people touching the statue and in the back…well his dangly bits are also shiny from people rubbing them for good luck. As for me, I think I’ll get my luck elsewhere. Safety first – While flying to Colorado for a snow adventure we decided to save some luggage space and wear our helmets instead of packing them. Let me tell you, if you’re wanting funny looks in an airport, walk around with a helmet on. Here’s to another entertaining year! Wonderful post! Thanks for the laughs! Wishing you a great Christmas, and tons of more adventure in the New Year! !